OK, so I have a confession to make. 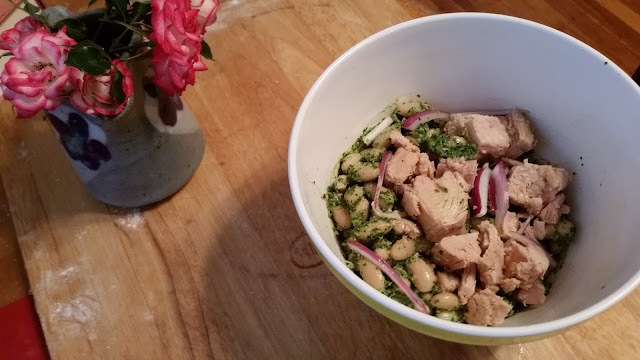 I'm still obsessed with this Herb Pesto Recipe. It's a great formula of (by weight) a little garlic, one part herbs and greens, one part nuts or seeds, one part cheese, and 1.5 to 2 parts oil. I've made it with parsley and carrot tops. I've made it with parsley and baby kale. I've made it with all basil. I've swapped in walnuts for the pumpkin seeds. 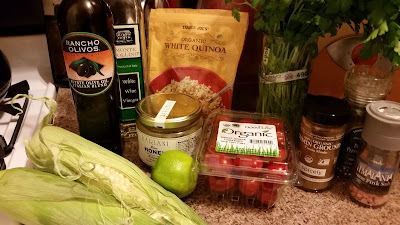 In order to indulge without going through a whole loaf of bread in a couple of days, I've been finding ways to use it with things other than hearty crostini. Herbs and baby greens are really beautiful right now, but of course, you could also make any of these things with pesto from a jar or made by your local market. Nobody will care, or if they do, they won't say anything because they love you and that's the most important thing about people you share food with. 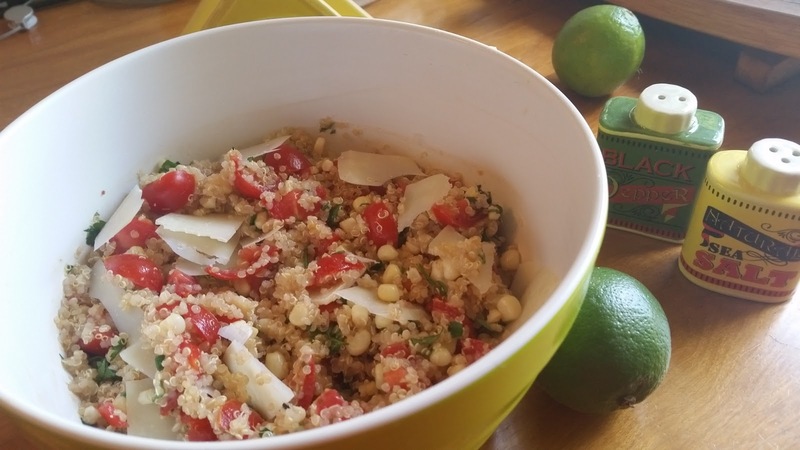 The classic: toss with spaghetti, gnocchi or shells, top with grated cheese. Roast or steam some carrots, toss them with the pesto. Roast or steam some new potatoes and/or turnips, toss with the pesto. Tuna, white bean and pesto salad (pictured): toss one can of drained, rinsed white beans with 1/2 cup pesto. 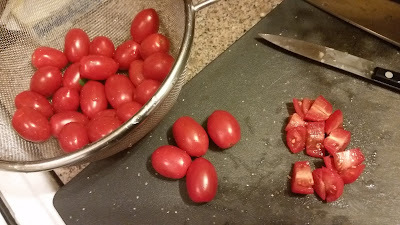 Top with red onion and/or halved cherry tomatoes. Serve as is or on a bed of salad greens. 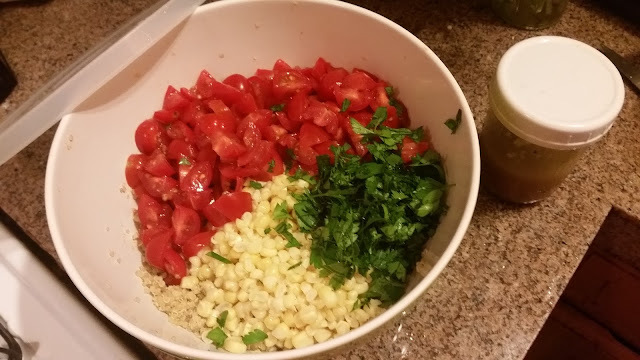 Mix with ground chicken for pesto meatballs. Use instead of tomato sauce for pizza, baked or grilled. Use instead of mayo on a cheese or turkey sandwich. I'm working on a sinful version of sticky buns using croissant dough, but the experimentation phase is taking a little longer than I hoped! 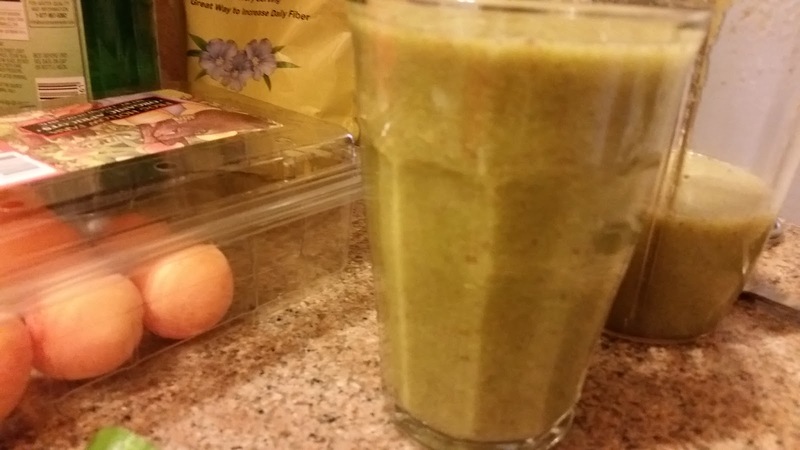 In the meantime, I thought I'd share my green smoothie du jour. Those delicious little Persian cucumbers are in season, and were on sale this week, so I made sure to use one. 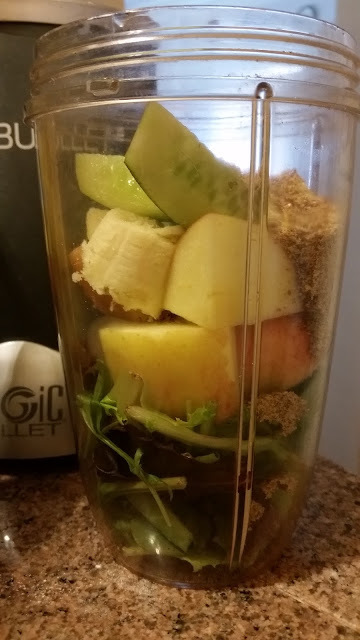 Put it all in a powerful blender (you might opt to peel everything if you have a gentler blender) and enjoy! Mine wasn't the prettiest color, since I didn't have avocado on hand to brighten it up, but it kind of looks like a pureed kiwifruit. One of the pics has apricots on the side, but those are so good right now that I will only eat them plain. After two months, the Blood Orange Liqueur is ready! 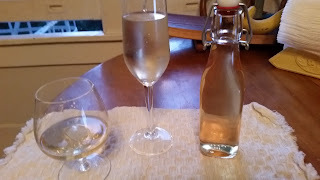 It's ready to bottle, and then to sip, pour over vanilla ice cream, or mix with sparkling wine or sparkling water. If you missed steps one and two, here is the link to those. Of course, before you start to bottle the liqueur, you need to find or buy some bottles that can be closed securely. If you go thrifting you might find a collection of lovely different bottles, and you can buy some synthetic corks to seal them if they don't have proper lids. I've been ordering swing-top bottles online from specialtybottle.com, which has a variety of sizes and shapes for much cheaper than the kitchen stores($5.99 each - no way!). The bottles pictured are 250 ml. Wash the bottles. 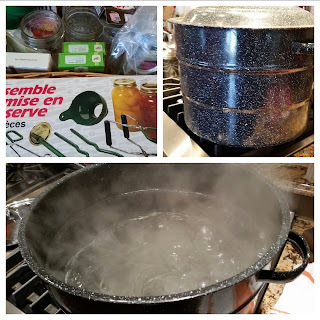 You don't have to boil them like for canning because of the high alcohol content in the Arancello, but wash them in warm soapy water or rinse them with diluted distilled vinegar to make sure they're clean. Put on some nice background music or a mindless TV show - the process will take about 30-45 minutes. 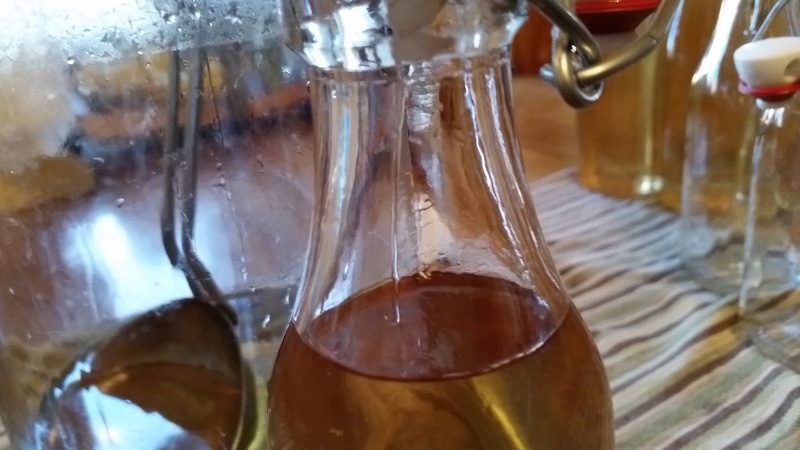 Place a dampened coffee filter in the funnel and the funnel in a bottle. Ladle the liqueur into the funnel and let it flow into the bottle. If it's filtering well, it should be a slow but steady stream like this. Fill a little higher than this, but not all the way up to the tippy top. Keep going until you've filled as many as you can. If it's going much faster than the stream above, there may be a hole in the filter, so just replace it when the liquid already in there has already flowed through. If it slows to a drip, either ladle more into the funnel or replace the filter with a new one. 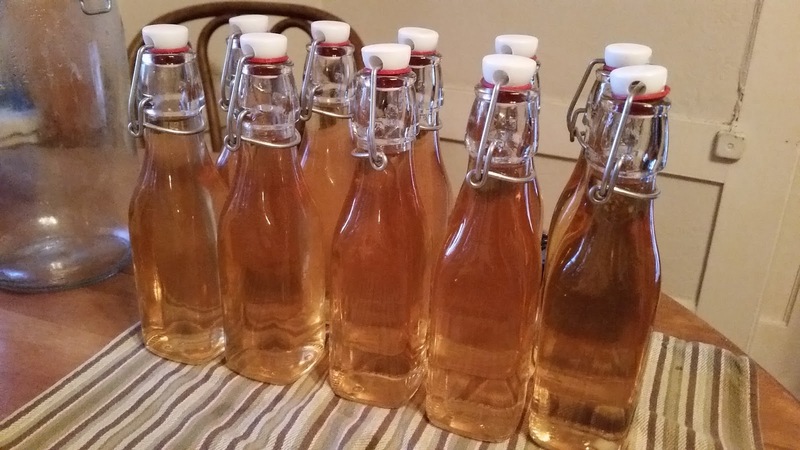 This batch filled about 11 and a half 250 ml bottles. Now I'm all set with hostess gifts for the next few months, plus a couple just for me. If you try to make it, let me know how it turns out! Blood orange season is short, but you could try other kinds of oranges or lemons. Meyer lemons are amazing, if you can get them. 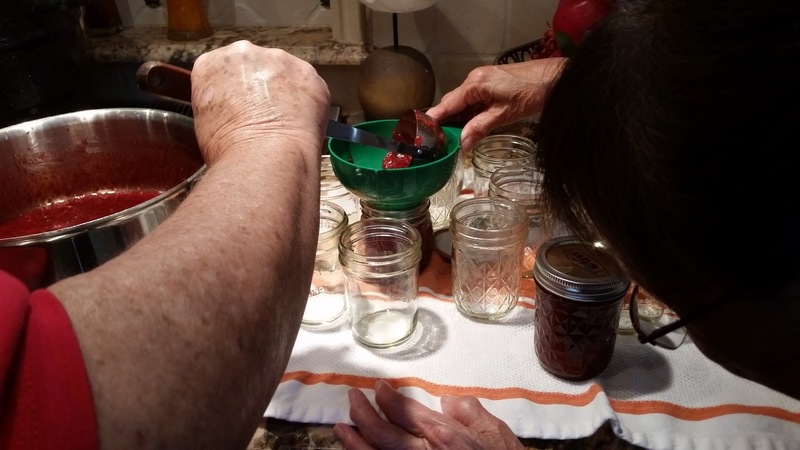 My momma is kind of famous for her jams and marmalades, but I'd never been able to make them with her. 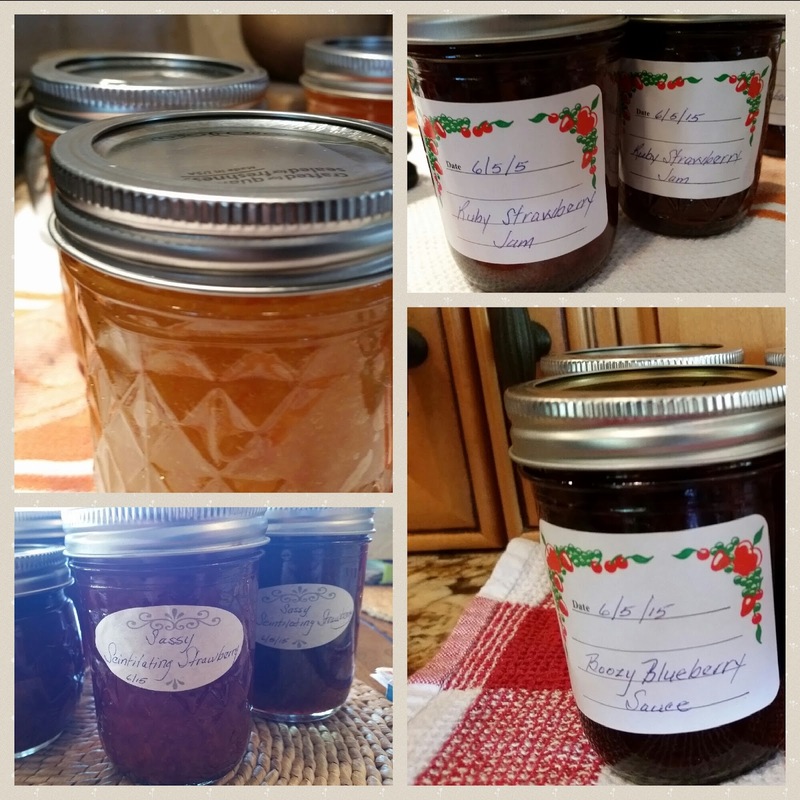 While she was raising two kids, working full time and commuting from Swarthmore to North Philly, my mom didn't have a lot of time to make jam. When we moved to California, she had a job that took her out of town a lot. By the time she left that job and had more free time, I was living 400 miles away. But finally, this weekend, I visited her and we got a chance to make jam together. We went to her friend Jeanette's amazing and spacious kitchen (with my fantasy six burner stove) and made two kinds of strawberry jam, some blueberry bourbon sauce, and tangerine marmalade with the help of Jeanette and another friend, Nora. All of this took just about four hours with so many hands and burners working at once! It's a time consuming task, but it's fairly simple. Processing in this way will make the jam shelf-stable for about a year. However, if the whole process just seems overwhelming, the jam recipes below should keep for about two weeks in the fridge or two months in the freezer without going through all the jar-boiling and sealing. I'm just going to share the strawberry recipes for now, as sharing all would be too much information. First, we stopped by the farm stand for the fresh-picked Oxnard strawberries. No luck on blueberries there (it's probably too warm an area) but we got some beautiful ones at the market. Mom now has all her canning supplies in a basket so she can carry them to friends' houses on request. The basket holds lids, rings, labels, a large funnel, two kinds of tongs and a magnetic thingy for taking the lids out of the boiling water. Wish I'd found this thingy before my finger got burned, but oh well. The canning pot, of course, is too big for the basket. It is fitted with a rack to hold the jars in. 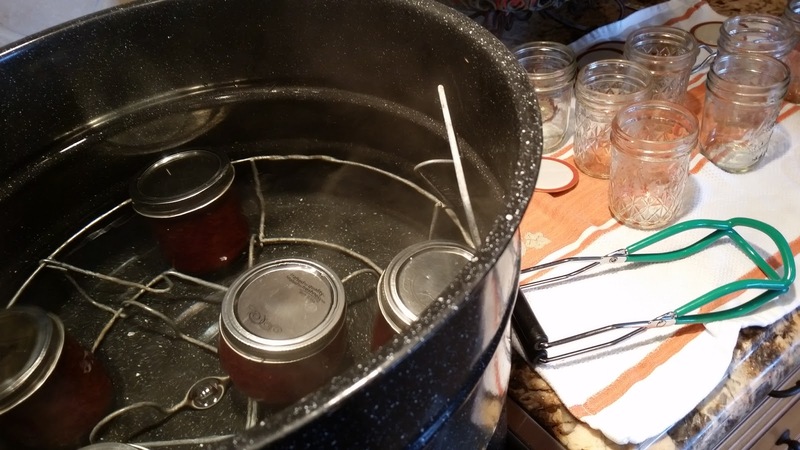 The first use of the pot is to boil the jars, partly to sterilize them and partly to warm them before you put in the warm jam. You can heat the lids in the same pot, again to sterilize but also to warm up the rubber to create a good seal. Remove the stems and most of the white core from the strawberries, either with a paring knife or with a nifty strawberry corer like this, sold by fine kitchen stores to people who like to buy gadgets for every purpose even though they probably have perfectly good paring knives. Mom's basket contains packages of pectin for emergencies, but she usually uses other fruits to extract the pectin needed to firm up the jam. The first recipe called for orange zest and juice (with pulp). This worked great but definitely added some orange flavor. 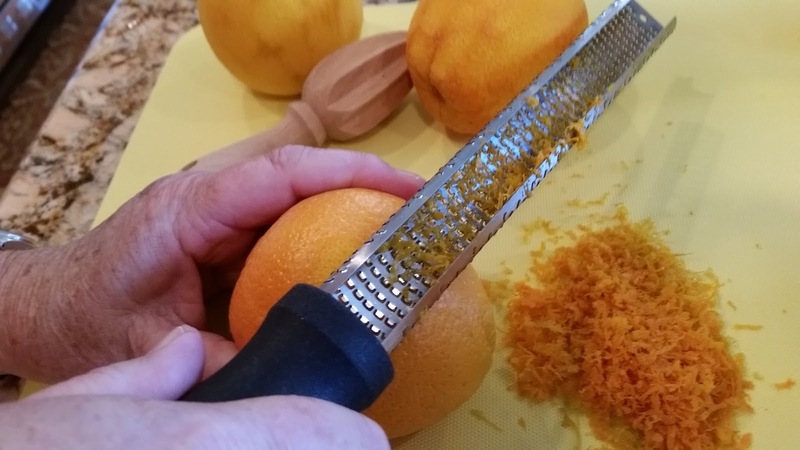 Note: hold the microplane on top of the fruit to zest it so you can see if you're getting any of the white pith. If you are, dump that bit so it doesn't go in the jam and make it bitter. 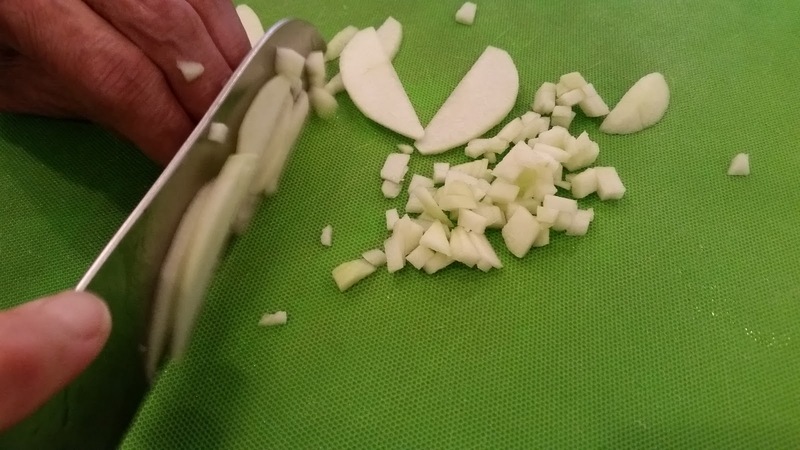 The other recipe used finely diced green apple, so we were glad to have Nora and her mad knife skills on hand. 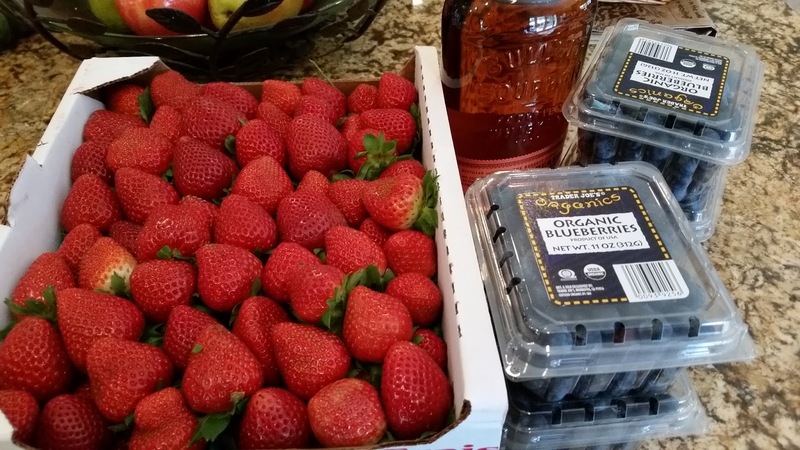 The apple is more neutral in flavor, so it didn't alter the flavor of the berries as much. We couldn't figure out why one of the recipes called for a tablespoon of butter to be added after the jam reached the required 220 degrees. A quick Google search cleared that up: the fat in the butter "disrupts" the foam that forms on top, saving you the trouble of skimming it off. 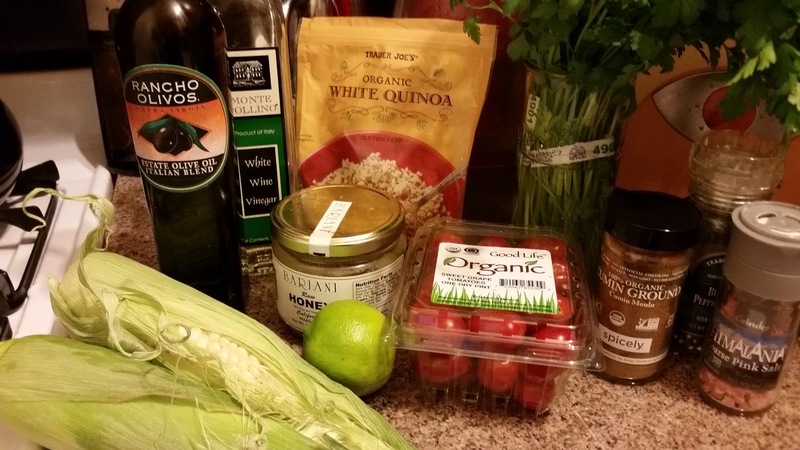 If you're vegan or dairy free, skip this and skim instead. We also couldn't figure out why none of the jams actually reached a temp over 210 degrees, but I suspect it's because we used a lot less sugar than the original recipes called for. When the jam was ready, it was ladled into the jars up to 1/2 an inch from the top. The next step was to make sure the top was clean, place the lid, and then screw on the rings until secure but not yet tight. 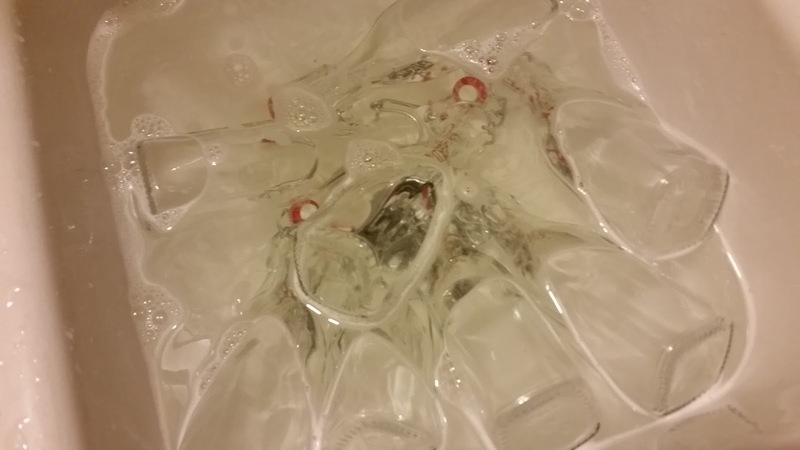 Using the "jar lifter" tongs, we placed the jars back in the hot water bath, turned the heat back up to high, and processed them for ten minutes starting when the water comes back to a full rolling boil. 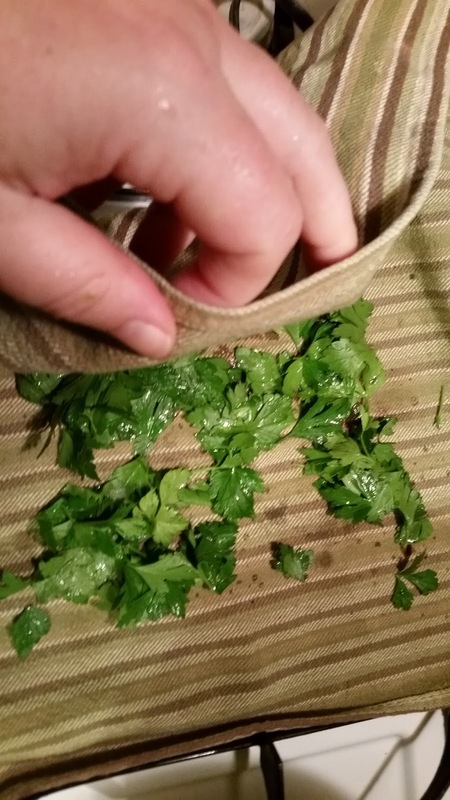 Remove and place on a towel to begin cooling. Make sure not to put hot jars on a cold surface. When they've cooled a bit, the vacuum created inside should have drawn the lids down a bit, so if you push down and they make a noisy "pop" back up, you may not have a good seal. It's like if you don't get that "pop" when you open a jar from the supermarket you don't eat that jar. Recipes: (I'll make them into cards this week, but Momma's computer doesn't like that website). Wash and stem the berries. 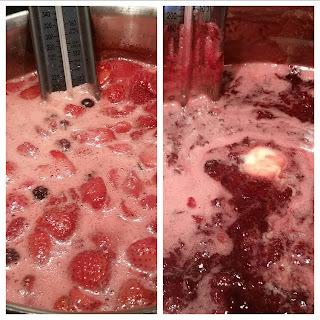 Place 4 pounds of the berries, the juice and the zest in a pan and bring to a boil. 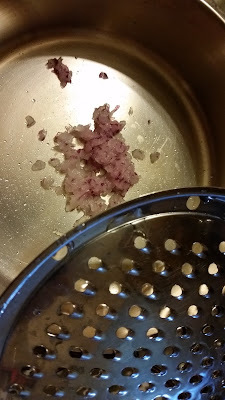 Mash the strawberries lightly with a potato masher. Add the sugar and stir until dissolved. Cut up the last pound of strawberries and add them in, then boil rapidly over medium high heat for twenty minutes, or until they reach 220 degrees, or until they thicken a bit and deepen in color, stirring occasionally to keep the bottom from scorching. Remove from heat, stir in butter, and let cool for a bit before adding to warm jars. Process as above. 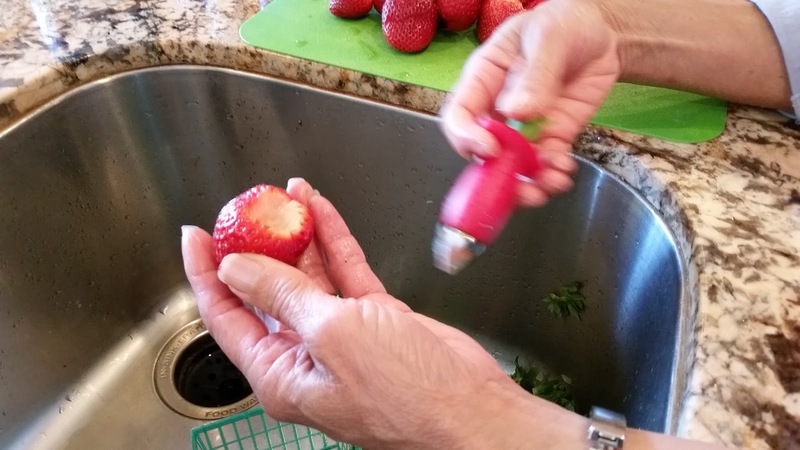 Rinse the strawberries in cold water and cut out the stems and white hulls. Cut the larger berries in two to four pieces each, leaving the small berries whole. 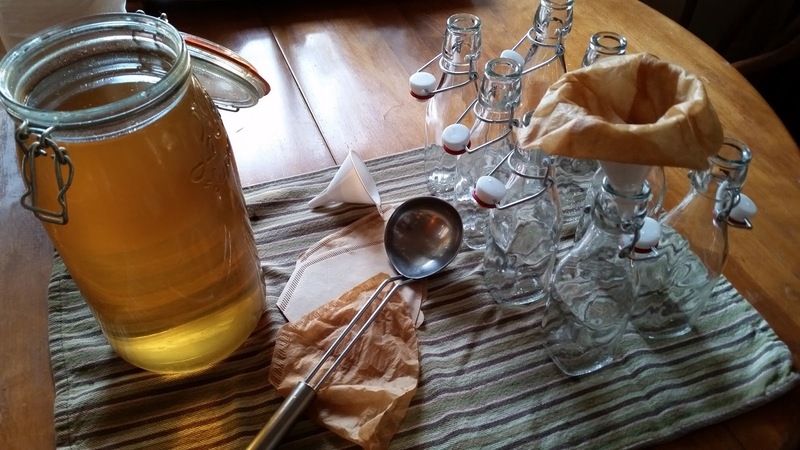 Toss with the sugar and orange liqueur, then bring to a boil. Add the apple and blueberries to the boiling strawberries. Stirring occasionally to make sure the bottom isn't sticking and burning, keep them at a full rolling boil, not a simmer, 25-30 minutes until they reach 220 degrees or they've thickened up a bit and become a beautiful ruby color. 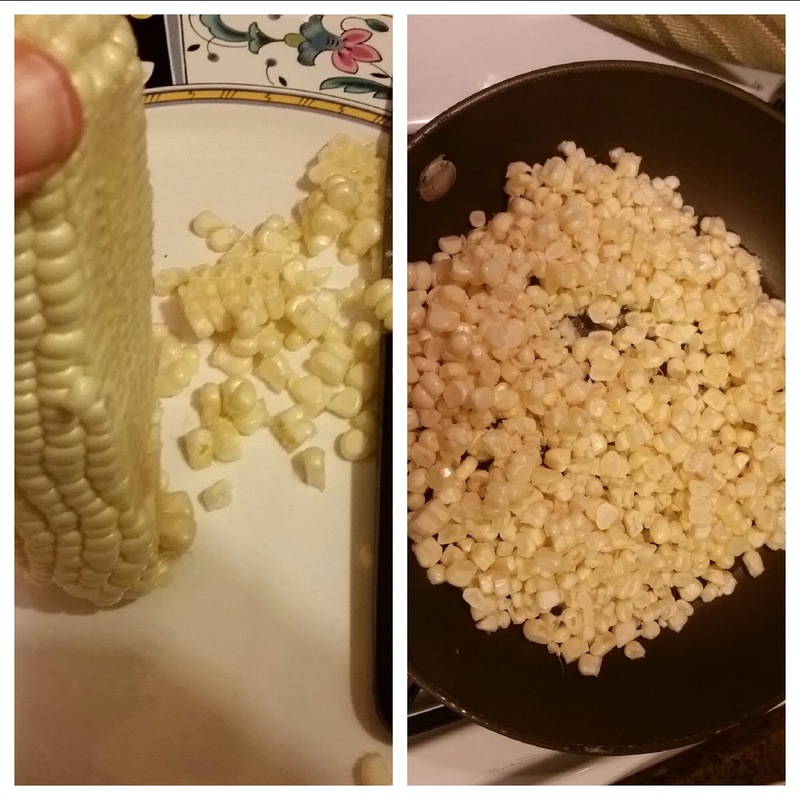 Remove from heat and stir in butter to eliminate foam. Process as above.